Much has been made of the controversy surrounding the use by PETA and the company Weatherproof of their use without permission of the likenesses of the First Lady and President respectively. No less than The Washington Post (PETA latest to use an ad with an Obama without permission, 1/8/10) and The New York Times (Coat Maker Transforms Obama Photo Into Ad, 1/8/10) have weighed in on this, along with countless other news outlets, and blogs. 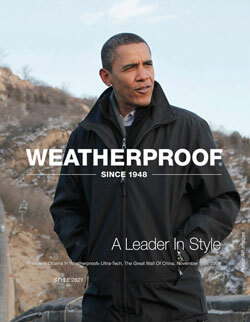 The image at right is one in question, of the President in a Weatherproof jacket in China, in this case, what seems to be a catalog page, which is a part of the larger objection to the Times Square billboard, which you can see in context in the Washington Post and New York Times links above. The law is pretty clear - in order to use someone's likeness in an advertisement/endorsement, you need their permission. Celebrities make untold millions leveraging their likeness for all manner of product, and that is good, right, and fair, since the corporations are profiting, why shouldn't the celebrity get a piece of that when they put their good name on a product or service? Not since prior to the dawn of the internet age have we had a President so primed to be used, given their heroic status. President Clinton was the last real candidate for these types of shenanigans, and the White House had to fend off more than one use, including the use of his likeness to promote a popular sub chain in the DC area - Jerry's Subs and Pizzas, which their Big Bubba sandwich. While the family of Martin Luther King was successful in the case of Martin Luther King, Jr., in the case Center for Social Change, Inc. v. American Heritage Products, Inc., 250 Ga. 135 (1982), it is, in large part, because MLK was a private citizen, and not a public official. Finance companies have used the President's image in video ads, and the President's voice has been used countless times in commercials on radio. Immediately following the Presidents inauguration, Bloomberg published a piece about White House efforts to quell the use of Obamas' likeness (White House Lawyers Look to Limit Commercial Use of President, 1/30/09) and they list a number of uses of the Presidents image and voice which are worth looking at. Of note is the suggestion that "Appropriation of a president’s face and voice, to a large degree, come with the territory, said Princeton University historian Fred Greenstein." Even the first daughters are not immune - when Ty - the makers of Beanie Babies came out with dolls with their names on them, and their names were evoked in ads looking to raise awareness for school lunch programs. It is important to note that rights of publicity that would govern these issues is a matter of state law, and varies from state to state. In point of fact, Shepard Fairey's original poster campaign of then Senator Obama, from which Fairey generated a great deal of revenue (which is has publicly stated he re-invested in other Obama-supporting efforts) did not have a release. While a single piece of art (or even a limited edition series) would likely not require a release, a poster campaign with tens of thousands of posters would. Perhaps when Fairey was later commissioned by the campaign to do a poster from a legally obtained image, that contract provided retroactive protections for the previous poster, or then again, perhaps not. However, picking and choosing which battles to fight can be problematic if a case goes to court. In the end, even if the billboards come down, Weatherproof has gottten their moneys' worth out of the campaign. It appears that Jim Mathis is teaching really bad business management skills if the message he is delivering to his students is that the price for an image should be the same whether it's a family down the street, or a multi-national corporation looking to use the image as the icon of its business for years. In response to my November interview in Photo District News about establishing your pricing, Mathis wrote in here and suggested that his studios' establishment in 1973 and immediate price list publication somehow gives him some air of authority, when he says of me "His is the type of attitude I have been fighting for years." Really? Really! Really? Wrong-way Mathis then suggests that my methodology is that of "sizing up the ''schmuck' and charging whatever we think they will pay..." and the only thing more wrong than that opinion is how he uses a portrait of himself with a Nikon F in his article about "digital resolution", where he incorrectly states "In reality, a five-meg, or 5 million pixel camera, is about equal to 35mm film in resolution." No, Jim, that's impossible. The actual megapixel comparison is closer to 21 megapixels. Fortunately for all, Mathis seems to be standing alone. PDN sought out two industry leaders for their thoughts. Susan Carr, past ASMP National President and current Education Director, wrote here "Pricing photography assignments cannot fit into a one-size-fits-all hourly or day rate system." Carr then goes on to provide several other worthwhile insights on this subject. Next PDN presents the learned thoughts of Jeff Sedlik, former National President of the Advertising Photographers of America, here. Sedlik suggests that some photographers "opt to spend their careers emulating plumbers". I suggest that Mathis has much to learn about his own business. Yes, being paid by the hour regardless of client type is really a day-laborer mindset best left for the picking fields. Mathis touts his membership in the "International Photography Hall of Fame", on his website here and I submit that he should be the poster child for the International Hall of Photographic Shame for his really really bad photography advice. When does "saluting" women in an ad become an endorsement? When the anti-war groups used an image of Gen. Petraeus in their ad (here) being critical, was that fair to do without his permission? How about an and that is positive, saying "Fur-Free and Fabulous!" and directing people to the PETA website to "Read all about it"? It doesn't come across, per se, as an endorsement, however, it seems to come very close to crossing a line - but did it cross the line? ExtraTV reports here that the White House is upset about this. 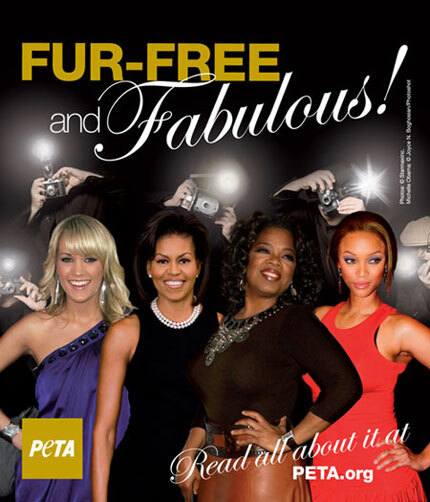 PETA's President, Ingrid Newkirk is quoted as acknowledging they didn't get permission because they knew it couldn't be done, however said "the fact is that Michelle Obama has issued a statement indicating that she doesn't wear fur, and the world should know that in PETA's eyes, that makes her pretty fabulous."